A 450-year-old Madonna and Child work by Titian has sold for $16.9m (£10.7m) in New York, setting a new auction record for the Renaissance master. A Sacra Conversazione: The Madonna and Child with Saints Luke and Catherine of Alexandria was sold at Sotheby's to a European telephone bidder. 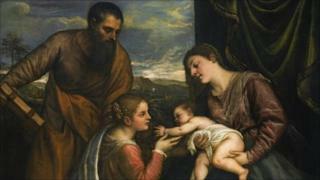 It beat the previous Titian auction record of £7.5m ($11.9m) paid at Christie's in London in December 1991. That was the price achieved for the artist's Venus and Adonis painting. A spokeswoman for Sotheby's said A Sacra Conversazione was "one of only a handful of multi-figured compositions by Titian that remain in private hands". It was also, she added, "the most important to appear at auction in decades". Sotheby's said the oil on canvas work - painted around 1560 - had changed hands only six times during its life. Prior to recent exhibitions in London, Paris and Amsterdam, it had not been seen publicly for 30 years. In 2008 the National Gallery in London and the National Galleries of Scotland launched a joint appeal to buy a pair of Titain paintings for £50m each. Enough was eventually raised to buy one of the paintings, Diana and Actaeon, for the nation. Funds are currently being sought to secure its partner, Diana and Callisto.